In 2006 our founder traveled to Cuyotenango, Guatemala with a family friend. There he found families living in unsanitary conditions with unhealthy food and water. Although the Guatemalan families worked hard raising chickens to sell at market, bandits would raid the ranch, stealing the chickens during the night, depriving the families of their only source of income. Determined to help, our founder established the Lupita Foundation, named after the patron saint, the Virgin of Guadalupe. 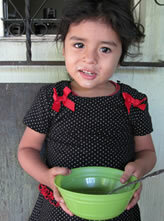 The foundation provides food, clean water, and security to children so that they may grow healthy, happy, and strong. •To bring health and security to children so that they may thrive.